I just finished installing Monty's ULTIMATE SOLUTION, and it seems to do what it says on the tin! Awesome! I didn't have to shim it at all (this particular screen seems to have a very tight backlight bracket), and the pattern is 99% gone! If you look very closely, a slight shadow is visible, and the shadow isn't perfectly uniform - but it's hardly visible! Close enough to perfect in my book! Brightness also looks awesome, going to have to go test this out outside. Quick side question - I've given up on fitting the SXGA matrix in the frame of the XGA screen (I always seem to make the screens worse every time I open them up - dust gets everywhere, and some of the layers are very easy to scratch), but the extra thickness of the SXGA screen means it doesn't fit with the WiFi antennas (it fits without them though). I can remove the whole back of the antennas (which seems to be "just" a ground plane), but I'm worried it might affect RF performance - does anyone have any experience with this? As far as I know the antenna just needs the base that sits on the screen's top edge, and the U-shaped antenna attached to it. Everything else can be removed (jewellery clippers work well). The metal frame is too deep because in the tablet it needs to make space for the digitizer. With the right tools the frame can be trimmed - there's some instructions and photos on the German Thinkpad forum: http://thinkwiki.de/%28X6x%29_SXGA%2B-D ... %C3%BCsten. Thanks for the info - that clears it up. The screen seems to fit (barely) without the WiFi antennas, so I don't think I'll have to trim the LCD frame at all. It fits but you may end up with some areas that are too tight, which affects the brightness there, similar to what happens when the lid is twisted. Which bugged me and I ended trimming the frame. Could someone recommend me a properly working and reliable LED kit (driver and LED strip) for X61 with SXGA? I have read this topic several times, but I can not decide what driver and stips should I buy for this mod. I suppose I have to buy a LED driver from Monty (if its available) and some LED stips from a place like iccfl. I can get rid of it by using some utility like flux (been using it on X220 with IPS LED and this is amazing). However I also know about the "shimming" effect which is unacceptable for me. So this LED kit should be shim-free. There is some interesting and tough info on the Monty's website. As well as reference to kits like Unboosty, etc. But I'm still can not decide. I've been very lax in updating my driver mod webpages with new information from the past year. For the time being I should probably at least take them down to avoid confusing people while I write an update for my new kits. Some of those mods go well past the point of 'making a custom board is more sensible', especially as some of the Chinese kits turned out not to work very well after all. Also, a number of us were never satisfied with the color of the Chinese LED strips. It's not just that getting the right white balance on an AFFS screen is tough, but also that general purpose white lighting LEDs give very washed out color reproduction (because the AFFS screens have a lot of overlap in their red and green filters in the yellow region, and normal whilte LEDS peak in the yellows). So now I'm also making custom strips with Nichia white RGB phosphor LEDs designed for backlights. If the new TLD3 design tests out, I'll officially be out of the prototype phase Fingers crossed. What do you expect the TLD3 will do better? It's a new version of TLD1, and once it's trimmed and installed should perform the same. There are two main changes. RA, RB and R3 are replaced by two cermet trimmer potentiometers. One adjusts the minimum brightness, the other the shape of the brightness step curve. That means it's not necessary to do any soldering to adjust the range, and it should also mean the board can be adjusted to any model (or personal preference) relatively easily. The second change is just a cleaned up layout. It should be easier to assemble, and now all the components that can be damaged by flexing (eg, caps) are arranged vertically rather than horizontally. That will minimize the amount of flex they see in handling. Right now I'm guessing flex is what killed Jesse's board (though I don't need to guess anymore, it just arrived and I need to inspect it). xiphmont wrote: RA, RB and R3 are replaced by two cermet trimmer potentiometers. One adjusts the minimum brightness, the other the shape of the brightness step curve. That means it's not necessary to do any soldering to adjust the range, and it should also mean the board can be adjusted to any model (or personal preference) relatively easily. So you are really going to build drivers with potentiometers. Wow. That is the ultimate user friendly solution for those who like to play with their hardware. And possibly very useful. My X61 is now the first laptop where the full range of brightness steps is in use. Step 15 sitting outside in the sun to step 1 for reading late at night. ....the inductor coil. Apparently due to overheating from the output short. It could take being shorted for a few moments, but apparently not for a long period of time. It was still functioning, but way off spec when I pulled it off the board, and shorted internally due to charred insulation. Replacing it with a new coil fixed the driver. So now I know that a output short is not indefinitely harmless after all; I thought for sure a short would blow the inverter fuse before the coil overheated. Ah well, that's still not *too* bad I think, and it's not dangerous. I don't think I need to do anything special about it for TLD3, just make sure to warn about it in the install instructions. Jesse, how long was the driver in a shorted state when you first tried to test it? Was it a very short time, a few seconds, a minute, minutes? The first two times I booted the screen was black. The first attempt lasted <30 seconds. Second attempt lasted 1-3 minuets - I wanted to 'debug' the problem which is my veiled way of saying flick the invertor with my finger, type ctrl+c, check the board isn't shorting with the lcd housing, ctrl+x. During the second attempt I touchet the driver board, around the power jack, and it was >70C. A minuet later I noticed the scent of burnt electronics. Perhaps a dab of hot-glue, or another insulator, could be added to the tail of the LED strip. jaspen-meyer wrote: The first two times I booted the screen was black. OK good, that was my latest guess. I tested against shorts many times, but not for more than 10-20s. It takes the coil a while to get hot enough to damage itself. jaspen-meyer wrote: During the second attempt I touchet the driver board, around the power jack, and it was >70C. A minuet later I noticed the scent of burnt electronics. 'Immediately' isn't necessary, I could put a number on it. No sense freaking people out, it's not quite that fragile But there definitely needs to be a warning to not leave it powered if it doesn't light up. I've also coincidentally gone to higher-current inductors, and the new strips have a teflon surround. Both would further mitigate the issue. I think the extra documentation is the real fix though. Continued thanks for your update posts on this exciting mod. And thanks to all your guinea pigs who are working on perfecting this with you! The TLD3 boards pass initial construction and testing. I need to tweak the component choices a bit to get the most useful range control, but I've already spanned the range of TLD1 and TLD2. All I have to do now is check assembled board component clearances in everything, ink the final BOM [and update all my webpages with more complete instructions for the new kits]. Then the LED kits will finally be out of the prototype stage, and I can crank them out en-masse. Just in time for ~ no one to care anymore! Will this work on the Samsung PVA panels on the X60/X61 Tablet? axur-delmeria wrote: Will this work on the Samsung PVA panels on the X60/X61 Tablet? can you tell me more about the PVA panels though? Samsung LTN121XP01, XGA, used in both X60T and X61T. Colors and contrast are not as good as the BoeHydis. Also Toshiba LTD121KC9B XGA screens were used. Like most Toshiba screens used in X series before X201T: junk. I do care, and intend to use the X61 beyond the 10'th year anniversary next year. But the Core2Duo platform is getting a bit slow. Two of my X61T's I have Samsung PVA panels. I'll see if I have pictures of the label at the back. The 3rd had the SXGA+ Boe-Hydis screen, but the protective glass layer had a lot of cracks. I removed that layer and tried to mod it for my non-tablet X61, but broke it in the process. Samsung LTN XGA panels: Oh, those screens are PVA? Huh, I'd run across one once (not in a machine) and thought it was a weird TN. Let me see if I can dig it out. At the rate I'm going I'll need to order more LEDs from Nichia before the summer is out! First batch of TLD3 came out perfect! Fittings work nicely on my various test machines. The second rev LED strip is also good... I was worried the staggered groups would cast a weird unnevenness on SXGA, but if anything, it appears to have reduced the tiny amount of remaining shadowing. I've also got a first cut of a website update up at http://people.xiph.org/xiphmont/thinkpa ... ight.shtml. Just a few more blocks of text, a few pics, and the design files for the boards left to upload. Upt-to-date installation instructions are there. I think we're out of Beta! The x61 TDL1 board and 335mA LED backlight are working great in an x60s LTN121XJ-L07 with coreboot (version 4). xiphmont wrote: I've also got a first cut of a website update up at http://people.xiph.org/xiphmont/thinkpa ... ight.shtml. Just a few more blocks of text, a few pics, and the design files for the boards left to upload. Upt-to-date installation instructions are there. About the removed 'about' link. It's supplemental information - place it in the text of other pages where it'll be in context / useful. Btw, I've ordered an XGA HT121X01-101. Which driver and which backlight does it need? jaspen-meyer wrote: The x61 TDL1 board and 335mA LED backlight are working great in an x60s LTN121XJ-L07 with coreboot (version 4). Well, the site is not just about my kits, or selling my kits, or even telling a linear 'buy a kit and install it' story. It's sort of a temple dedicated to the craft of modding. That said, folks who are on the 'buy it/install it' track may not be interested in all the extra info. Ordering and installation has to remain somewhat streamlined to avoid losing.overwhelming people. That's one of the TN screens. Either kit works fine, but the Daylight kit is sort of overkill for TN. Unless you need >> 1000nits. It's just a TN screen?! Darn, I read BOE Hydis XGA and assumed that was not TN. contrast and color saturation would be better than my LTN121XJ-L07. It's sort of a temple dedicated to the craft of modding. Ok. Consider renaming the link text to something more descript and which tells the user what's, if this were price is right, "behind door number two". One try is 'Overview'. Btw, about navigation placement - look up "heat maps" and you'll see why I repositioned the navigation in my mock-up. jaspen-meyer wrote: It's just a TN screen?! Darn, I read BOE Hydis XGA and assumed that was not TN. contrast and color saturation would be better than my LTN121XJ-L07. I've never had a new one to measure what it's supposed to be like with the CCFL. With LEDs, the BOE screen is warmer, but contrast measured about the same with a 10-degree FOV, 186:1 vs 166:1. My impression was they were comparable-- very narrow vertical viewing angles on both, but both exceedingly bright compared to AFFS. jaspen-meyer wrote: Ok. Consider renaming the link text to something more descript and which tells the user what's, if this were price is right, "behind door number two". One try is 'Overview'. Btw, about navigation placement - look up "heat maps" and you'll see why I repositioned the navigation in my mock-up. It's pointing to a page that is, in many ways, one full level up in terms of subject matter. Eventually there will be a few levels there since this is just the pages that are there now. More are in the works on other ThinkPad topics. So, 'more descriptive' in one word is hard. I'm not entirely satisfied with 'About', but I haven't though of anything much better either. As far as 'heat maps' being a reason for left-justification of topnav, I think you're presupposing a typical multicolumnar layout that's oriented toward menus on the left. I want a 'reader'-like arrangement with most of my out-of-band information on the right, not left. Not to mention, reading the title leads your eyes directly to the topnav at right, and putting it left is incongruous with the visual design. If the choice is between having it left-aligned and right-aligned, I want it on the right. If there's some other better choice, I haven't thought of it or seen it yet. xiphmont wrote: As far as 'heat maps' being a reason for left-justification of topnav, I think you're presupposing a typical multicolumnar layout that's oriented toward menus on the left. When initially evaluating a page, perhaps, but I'd expect some of that goes out the window when you start actually reading text. Based on that link, it is heavily dependent on site design, and I think it only supports your conclusion for multicolumn layouts, especially ones where the left-hand column is a menu/funnel. Look at single column, and single column with a topnav--- heat is evenly spread along the top. Several of your other suggestions were quite good; I was already looking for an improvement I liked, and you suggested something I liked and worked well. This time around... I suppose you could convince me, but you haven't yet. Let me pose it as a question, and the question is genuine; Do you prefer the topnav justified to the left because the rules say it should go there? Or because, leaving all rules aside and judging the page in only its own context, it works better in this case? I dug through my pile and found a Samsung PVA screen. Last week I also ordered a cheap used one off eBay for secondary testing. The eBay one arrived aaaand... it wasn't a Samsung panel. It was a HV121X03 with a Samsung sticker slapped on it. It had also been taken completely apart at least once. So much for 'New pull'. At least the one I pulled from the basement was the real thing. With the Daylight strip, color was too cold (7492K) as expected; my experience in the past is that PVA color transmissivity is like TN. 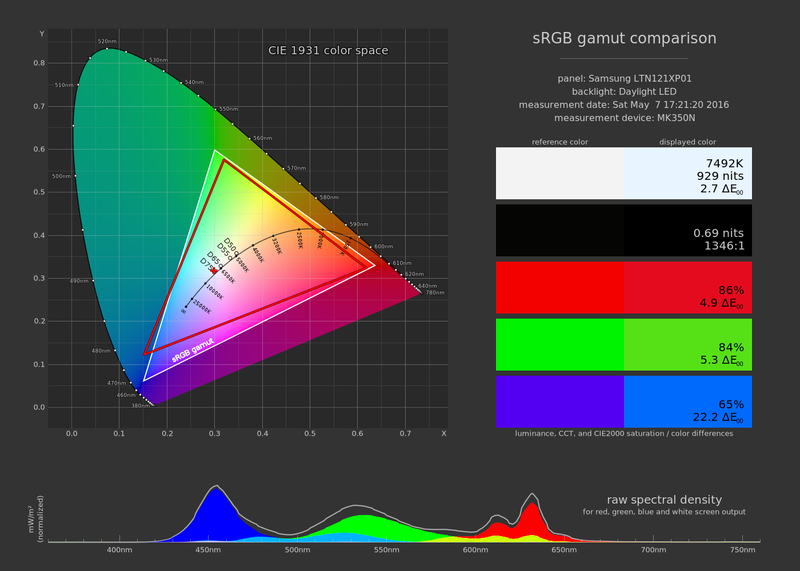 OTOH, it measured 1346:1 contrast (AFFS is typically 750:1), 929 nits, and just shy of full sRGB coverage. No accordian shim is needed, the strip can be fit like the other XGA screens. I measured it fit as such, that probably accounted for about half of the 'too cold'. Too bad these are just XGA. It's actually a nice screen. xiphmont wrote: Too bad these are just XGA. It's actually a nice screen. Very interesting. I do not remember that screen being so nice. A cheap way of getting a decent true in sunlight usable screen if you can live with XGA. Saw that you finished the pages on the design details on the different drivers. Do very much want one of those TLD3 Daylight kits next month. I have been using my X61 a lot outside on the balcony whenever the weather is good enough. No problems using max brightness in sunlight for hours. The rest of the machine gets very hot of course, a black laptop and direct sunlight are not best friends. Just installed one of the Daylight kits. Man, it's awesome. I'm sitting at my desk running at about 2/3 brightness, everything above is too intense for indoor use. This is awesome! Also, the SXGA pattern is completely gone, but due to my sloppy lid assembly I have a few "brighter" areas at the top left corner from pressure on the panel. I'll get around to fixing that later. All in all, Chris continues to create great stuff!